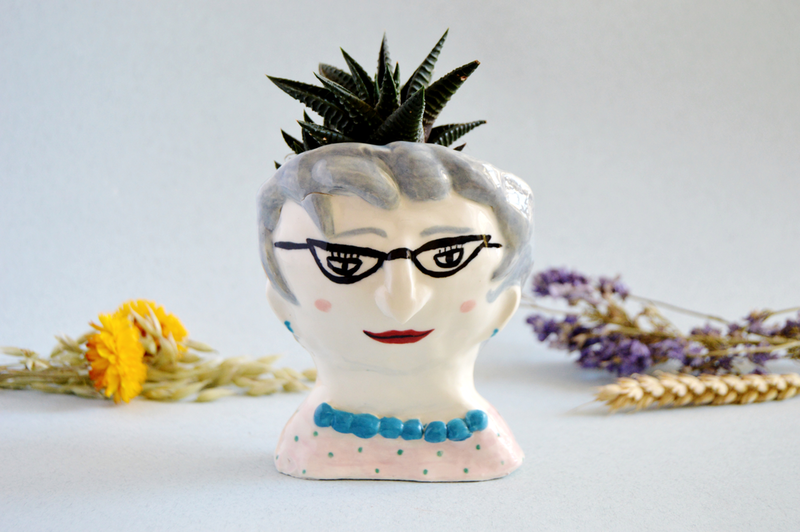 This constantly evolving and growing collection of ceramic vases is inspired by strong-minded and liberated female artists of the beginning of the 20th century. This project depicts women in my own illustrative style. Their common point is not only that they were female artists of the first part of the 20th century which is an era that inspires me artistically, but that they were all scandalous for their art and love affairs and emancipated for their time. They followed their passion and were independent, not caring about the social conventions of the beginning of the century, in which women could rarely choose their own destiny. Nowadays it is much easier in our country for women to follow their own ambitions and love but I feel that being strong-minded, eccentric and fiery (like they were) is still not well regarded by society. Female artists vases. Handbuilt with porcelain or eartherware. Female artists brooches. Handmade with porcelain. From top left to bottom right: Agatha Christie, Louise Brooks, Frida Kahlo, Virginia Woolf, Daphne du Maurier and Josephine Baker.